Each comic author has his/her very own way of drawing. When an author takes over an existing character(s) you’ll often notice this through the ‘signature’ way of drawing. In many cases the overall style changes quite suddenly (see for example the changes that happened to Willy Vandersteen’s Spike and Suzy each time a new comic author started working on the main sketches or Spirou and Fantasio); in other cases the changes can only be seen when you really pay a lot of attention to the details (see for instance the new Asterix albums which graphically are extremely close to the original Uderzo drawings). Drawn by Bob De Moor or Hergé? Unlike most predominantly Belgian studios, the Studio Hergé was known to never let things go ‘out of control’. Even though several artists worked on the same album, the basic rule was that it should not be noticeable. 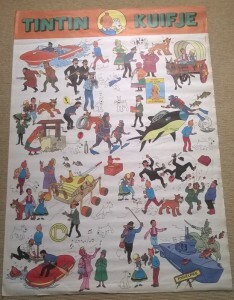 It explains why for instance the cars, planes, boats, decors and even the telephones have a similar drawing style in a Tintin album although they were all drawn by different people. Nevertheless, from time to time you can see a detail that will tell you who drew what. 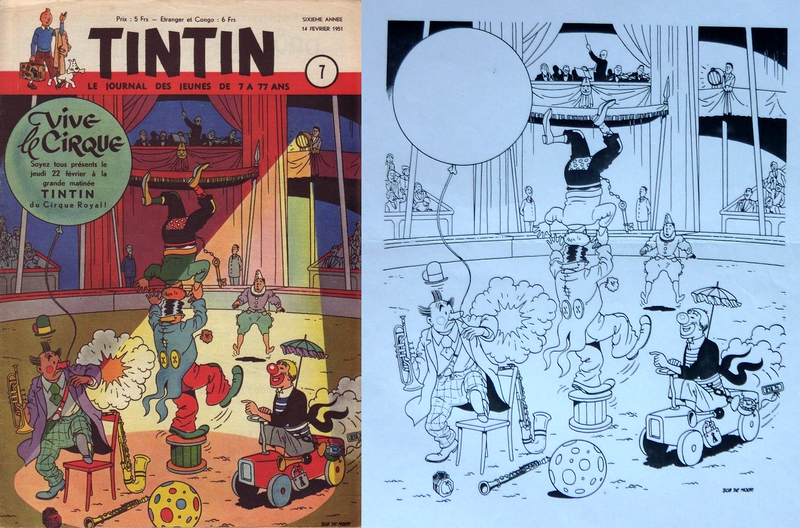 On February 14th 1951 the Tintin Journal had a frontcover created by Bob De Moor which acted as an invitation for an afternoon organized at the Royal Circus on Thursday February 22nd 1951. You will recognize the same drawing style Bob De Moor would use in Barelli‘s first adventure (which had debuted a few weeks earlier in the Tintin Journal). Whilst cruising through the De Moor archives we stumbled on a black and white version of this cover, a copy of the original drawing that is. The colored and the black and white version. 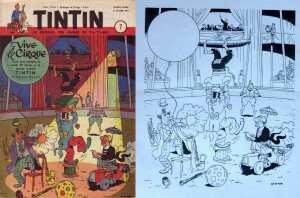 If you look closely you’ll notice that the original was slightly bigger than what got printed in the Tintin Journal. Both the left, right, upper and bottom borders of the original drawing got trimmed for the final result. In the bottom border this caused that the shadow of the ball is not visible and the harmonica and klarinet have been partially cut off. On the right you’ll notice that the number plate is not complete in the final version. The colors used for the print version added quite some depth to the drawing, the light beam being the most prominent extra which the black and white version does not represent. Speaking of that light, Bob De Moor might not have counted on that light when he finished his black and white version. None of the front characters or items show a long casted shadow, which you’d expect, instead he probably counted on a light beam that came from above too which would result in the shadows you see with the ball and under the car. 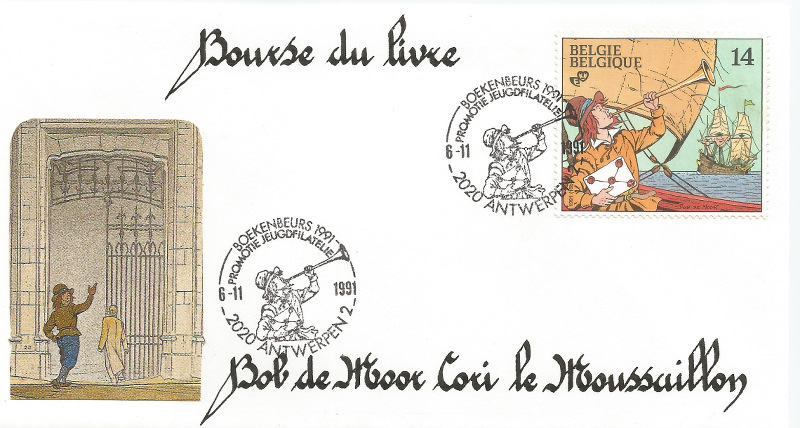 The issue we handle here included 2 more Bob De Moor series: Conrad Le Hardi and Barelli. In other words: busy times for Bob De Moor who was also working on Tintin‘s “Destination Moon” album version by then (the story had already been presented in Tintin Journal). 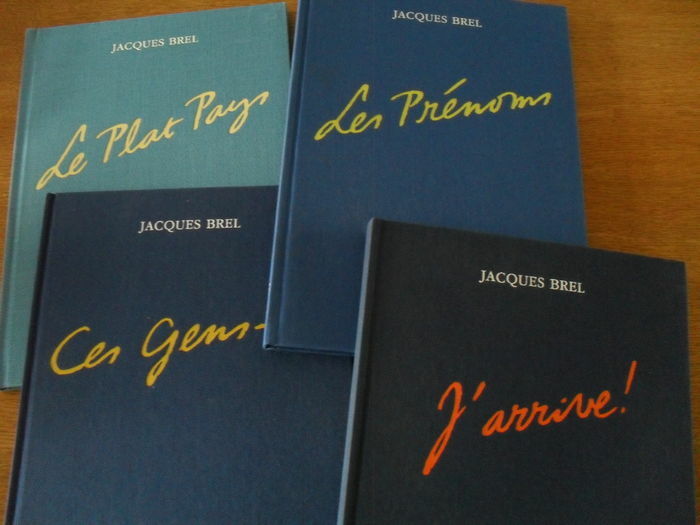 In 1987 and 1988 the Belgian publisher Brain Factory International released a 4 volume counting book series holding interpretations of Jacques Brel songs by comic authors. The 297 x 215 x 50 mm big books counted over 85 pages each and came as very well layouted deluxe editions and as a normal edition. We’ll talk about the deluxe edition which we have in our collection here. The 4 deluxe edition volumes as released by Brain Factory International. For the 2nd volume “Les Prénoms”(1987) Bob De Moor, just like many other comic authors, delivered a 4-page story for this series which must belong among his darkest work ever. Volume 1: Le Plat Pays (1987) with contributions by Tibet, Jean-Louis Lejeune, Frank-Ivo Van Damme, Alec Severin, Jean-Claude Salemi, Eddy Ryssack, Jarry, Jean-Claude Servais, Carine De Brabanter, Frédéric Jannin. 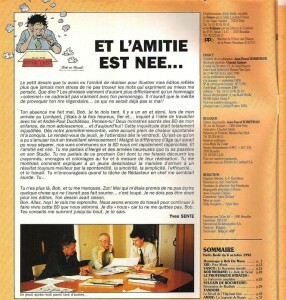 Volume 2: Les Prénoms (1987) with contributions by Isabelle Busschaert, Didier Conrad, André Geerts, Mitacq, Will, Peyo, Laudec, Bob De Moor, Marc Hernu, Bédu. Volume 3: Ces Gens-là (1988) with contributions by Dany, Rossi, Peter Van Straaten, Henri Kichka, Fred, Jean Solé, Magda, Liliane & Fred Funcken, Derib, Edouard Aidans. Volume 4: J’Arrive (1988 ) with contributions by Tadeusz Baranowski, Ab’Aigre, Péji, Christian Lamquet, Gilles-Marie Baur, René Botti, Michel Kichka, Fabrizio Borrini, Jean-Claire Lacroix, Françoise Amadieu. The page we present you here is the 2nd page of the 4-page story which is based on the Jacques Brel song “Jojo” taken from “Les Marquises”, Brel’s 13th and final album released in 1977. Brel would die a year later. It was also the singer’s first album of new songs in ten years. The song handles the death of a dear friend with whom the leading character has shared everything. 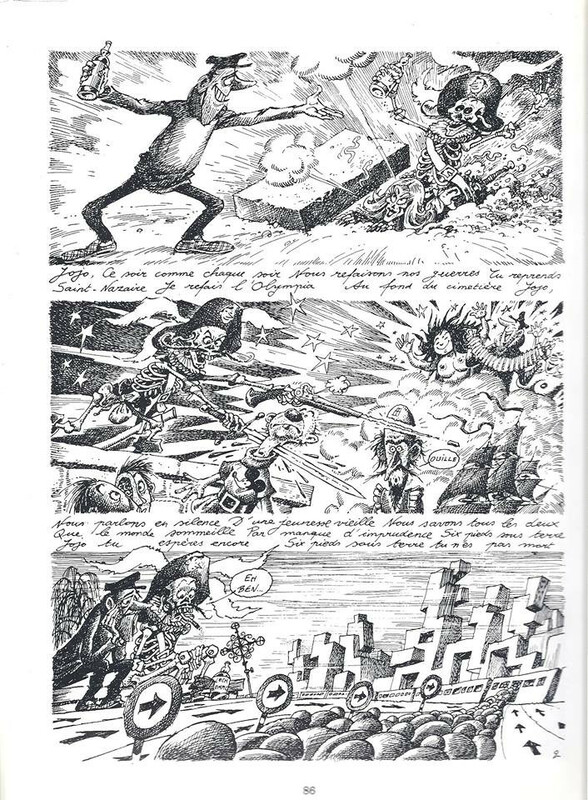 The sketchy penned artwork style as chosen by Bob De Moor – just black and white and no colors – belongs among the darkest he ever created and reminds us a bit of André Franquin‘s “Idées noires”. It shows again that he was able handling quite a few different styles and delivering the unexpected. The 4 volumes can still be bought in one go (check here) or you can order the “Les Prénoms” volume as standalone (check here). Below you can listen to the lovely Jacques Brel song “Jojo” which was the inspiration for this Bob De Moor story. Bob De Moor would create several watercolor paintings throughout his career. For many amongst you that won’t be such a surprise as this side-hobby was also documented in the must-have-but-now-deleted Bob De Moor biography “Bob De Moor. 40 ans de bandes dessinées, 35 ans aux côtés d’Hergé” which Le Lombard released in 1986. In the De Moor archives we found quite a few of these paintings. Today we present you a painting from 1947, the year in which Bob De Moor saw his career launched as he was creating more and more series for such publications as Kleine Zondagsvriend, NV De Gids, Nieuws van de Dag, Zweep, Week-end etc.. 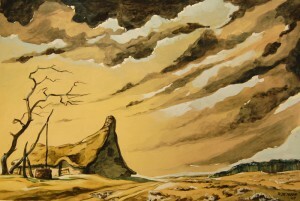 The watercolor painting by Bob De Moor, 1947. The painting is signed ‘R. De Moor ’47’ and has never seen the public eye until now. It shows a very old, tear down house with a straw roof and a water pit at the edge of a forest (on the right). It’s set in late Fall/Winter, recognizable at the first glance through the leafless three. The wind is being evoked by the position of the three (bending right) and the stratocumulus shaped clouds drifting from left to right. On the path you’ll also see a small pool of (frozen?) water. The 1947 painting we show you here might also remind you of the setting you see in the 1947 album “Le mystère du vieux château”. Page 28 of that old album for instance also shows a house with a straw roof and the house has the same bended entrance. Did Bob De Moor create this painting based on his work for the album or was this painting created before the album saw the light of day? We will never know of course. But one thing is sure, the artistic elements in the painting and in the album refer quite a bit to the style Walt Disney had been using in his 1937 movie “Snow White and the Seven Dwarfs”. A style which Bob De Moor adored back then. We’ll get back to Walt Disney in the future when we show you some pictures of a trip Bob De Moor made to one of the Walt Disney theme parks. Speaking of “Le mystère du vieux château”, the Dutch reprint is not ready yet. We’ll publish an article when it’s out and normally we’ll also have an article up with the team that worked on the restoration of this album. 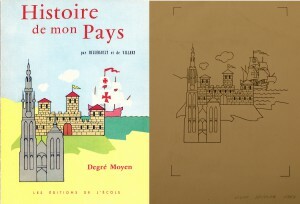 On the left the final cover as it was printed, on the right the cover as drawn by Bob De Moor. There is no shadow added using bold lines in the church/cathedral in the original drawing. If you look really close, you’ll see that the brick lines in the castle differ from the final cover, where some lines are missing (did they paint over it?). The lines are also a lot less clear in the final cover, again an indication that the drawing has been tampered with. Other lines from the original drawing have been erased too: the clouds, the landscape, the waves in the sea. The boat from the original drawing is missing most of its inside artwork in the final version. As a result the sails are almost invisible in the final version. We will probably never know what really happened to this cover, after all, it has been 54 years since the decision was taken to change what Bob De Moor had delivered and nothing seems to have been documented. Nevertheless, it’s now 100% sure that this cover was indeed drawn by Bob De Moor. If it hadn’t been for some of our readers (Petja van den Hurk for instance) who have the book but ignored who drew the cover artwork combined with a visit to the De Moor archives, we’d never have known/guessed also because the family De Moor did not have the actual book and didn’t know of its existence making the identification of this drawing not an easy task. 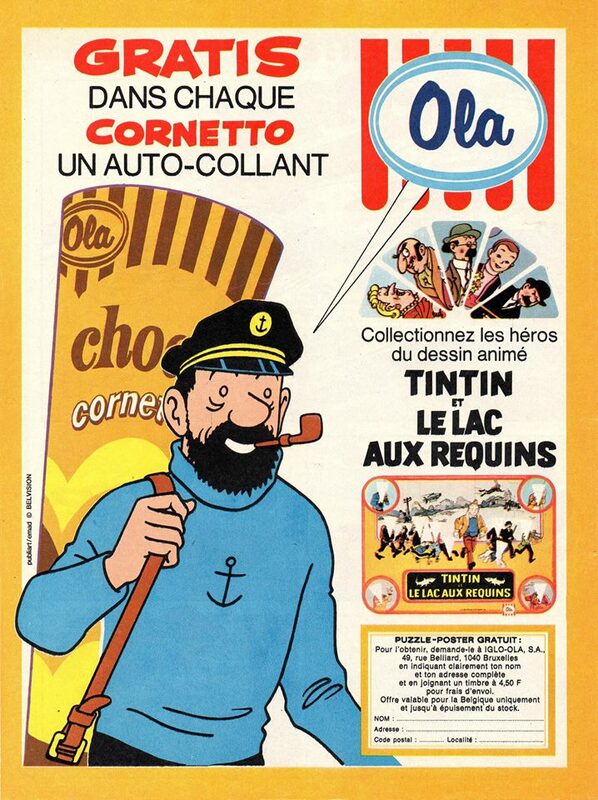 When “Tintin and the Lake of Sharks” (French: “Tintin et le lac aux requins”) animation film was released in December 1972 by Belvision on a scenario by Greg (Michel Regnier), Belvision put a lot of effort in promoting the film the best they could. Apart from the well known film poster (also designed by Bob De Moor) several other promotional / merchandising items were created. Today we’ll show you a a poster (70 x 100 cm) which was designed by Bob De Moor and published by Belvision in 1973. It’s quite a rare item. 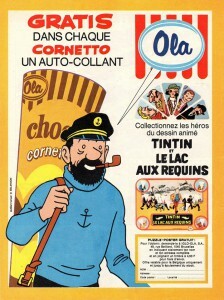 The “Tintin and the Lake of Sharks” poster as published by Belvision in 1973. 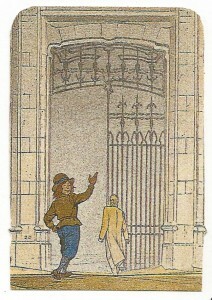 The item was used for the Belgian market, hence the bilingual Tintin/Kuifje heading, and seems to have been used . It depicts several scenes from the film (without the background), but the scenes were re-drawn by Bob De Moor. This happened possibly because none of the fragments depicted are shown in their entirety in the album version. So unlike what many seem to think, these drawings were not the ones as used in the final version nor in the magazine/newspaper versions we have commented on in the past. It suffices to take for instance the 2 thieves entering the Oceanographic Museum in Brussels or the Thomson and Thompson falling over the golf balls to notice that these drawings are quite different from the album versions. For a collector this poster is therefor quite an interesting find. We don’t have a copy of this poster, if you have one, let us know. Tomorrow we will take a first dive into the archives of the family De Moor with a find that we didn’t expect at all. In 1980 the team at the non-governmental environmental organization Greenpeace were looking out for a second boat to supplement the Rainbow Warrior. A scoping team was across all European ports in order to find a ship. When they returned to the headquarters they recommended an old North Sea pilot boat called the Sirius, a ship originally owned by the Royal Dutch Navy. That name of course rings a bell with more than just one Tintin fan because the Sirius is also the name of the boat in the 1944 Tintin album “Red Rackham’s Treasure”. 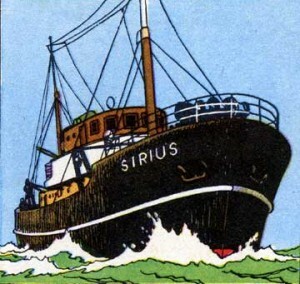 The Sirius was the ship used by Tintin, Captain Haddock and Cuthbert Calculus during the treasure expedition searching for the treasure of Red Rackham. Rémi Parmentier, founding member of Greenpeace International (1979) and several Greenpeace national organisations, but also Tintin fan, contacted the Hergé Studios in Brussels and met with Bob De Moor. Parmentier wanted to know if Tintin’s Sirius was ‘their’ Sirius. The answer was no. Hergé had sketched the Sirius from a boat in Antwerp that wasn’t called the Sirius. Rémi Parmentier posted about this event on his blog in 2007, but he mixed up quite a few details in that post, for instance claiming that Bob De Moor was behind the sketch of the Sirius. De Moor wasn’t even working with Hergé when the Sirius was drawn in 1943. Nevertheless, the story doesn’t end there. 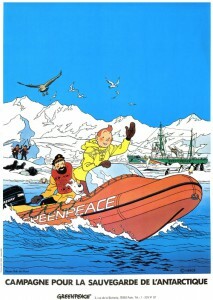 Parmentier suggested that Tintin could be used for a Greenpeace campaign. Bob De Moor said he’d discuss it with Hergé but things took longer than expected though. According to Parmentier Herge’s “finance guys made an initial offer that looked extravagant to the tiny Greenpeace organization of the time” and by then Hergé had gotten increasingly sick, eventually succumbing. Jean-Marc Pias, one of the main Greenpeace designers at the time, in the end succeeded in finalizing a deal whereby Tintin became a virtual crew member of Greenpeace’s Antarctica campaign. 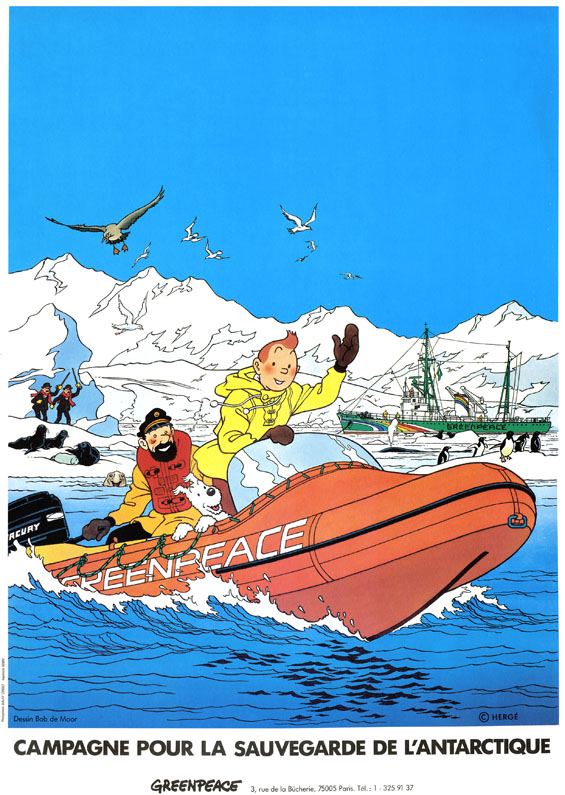 As a result Bob De Moor was asked to create a design for a poster holding Tintin, Captain Haddock and Snowy on the Greenpeace zodiac. In the background on the left you see Thomson and Thompson waving for help (it looks like it that Tintin and Captain Haddock left the duo on an iceberg). In the background on the right you see the Sirius. 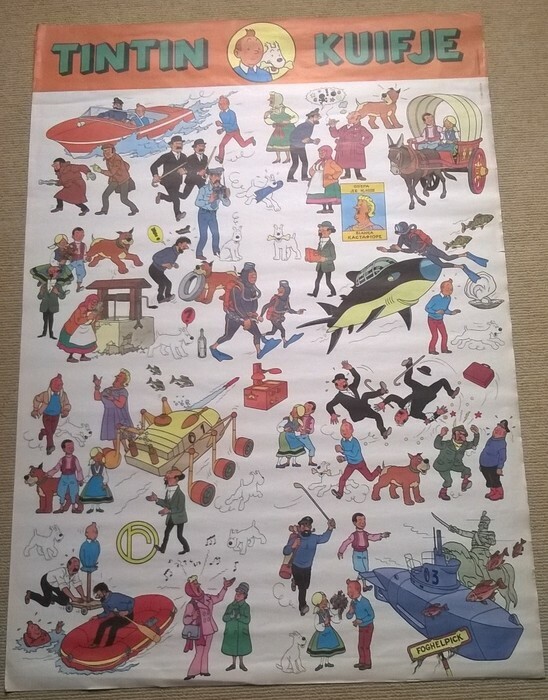 As Parmentier recalls: “It sold faster than croissants on a Saturday morning in a Paris bakery.” Until today the poster remains a favorite item with Tintin fans. So what happened to the Sirius? When Greenpeace bought the ship in 1981 it was refitted, repaired, and repainted adding a green hull and rainbow colours. A white dove of peace with an olive branch was painted on the bow (as you can see on the poster). The Sirius served as the flagship of Greenpeace Netherlands through 1998, after which she was retired. She is now docked at Amsterdam, where she serves in an educational capacity, offering shipboard tours and environmental education. And to add some back-to-the-past info, you might remember that the first Rainbow Warrior was sunk whilst in the port of Auckland, New Zealand by operatives of the French intelligence service (DGSE) on 10 July 1985, during an operation codenamed ‘Opération satanique’. During the operation (which included 2 timed explosions) one of the activists, photographer Fernando Pereira, was killed. As the truth came out the resulting scandal resulted in the resignation of the French Defence Minister Charles Hernu. 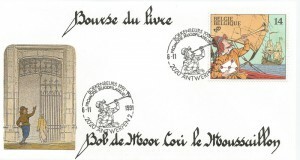 In 1991 the Antwerp based book fair called Boekenbeurs in collaboration with the Belgian Post launched an envelope and stamp holding ‘Cori Le Moussaillon’, and this to promote the youth philately. Whereas the stamp is widely known, the drawing on the envelope is less known (to some extent). The detail on the envelope, the print quality is appallingly bad. The drawing itself refers to the Belgian Comic Center which is based at the Zandstraat 20 in Brussel. There are a few elements indicating this. First of all, you’ll see that Cori is walking through sand. Secondly, on the left you can see the number 20 on the wall. A 3rd element is the Art Nouveau aspect you find on this drawing and also in the warehouse as designed by Art Nouveau architect Victor Horta. You will also recognize the main entrance gate. But something isn’t right in this drawing. It’s not a Bob De Moor drawing, only Cori is. 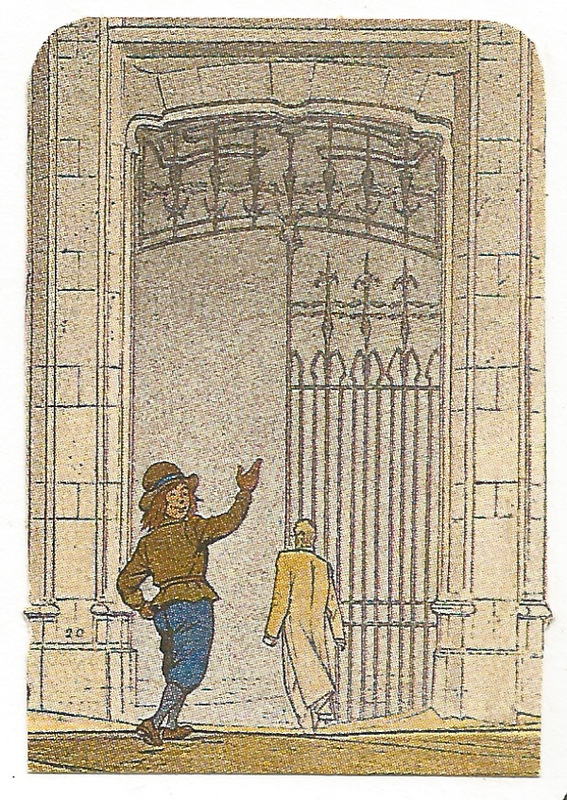 Entering the gate is a figure having the François Schuiten‘s signature and that is a give away that this drawing is part of something else, something bigger. Front of a 4-stamp booklet sold in 1991. 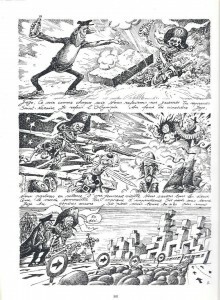 The original bigger drawing holds Cori, Blake & Mortimer (which Régric points out as possibly also drawn by Bob De Moor) and Boule & Bill pasted on Schuiten‘s – sublime – background. This was published in 1991 as a booklet cover holding 4 stamps holding characters as designed by Edgar P.Jacobs, Bob De Moor, Francois Schuiten and Jean Roba / P.P.G. De Schutter. The composed drawing on both the booklet cover and on the envelope was quite badly printed. You’d expect the Belgian post to do a better job than what they did here. The 4 stamps in the booklet. For those who don’t know (Baron) François Schuiten, he is a Belgian comic book artist and best known for drawing the series “Les Cités Obscures” (Casterman). That Schuiten appears with a Victor Horta inspired background shouldn’t be a surprise, together with Benoit Peeters he also helped to save and subsequently restore the ‘Maison Autrique’, the first house designed by Victor Horta. These envelopes can still be obtained here and there and fetch something between 5 to 10 euro a piece. Maybe artistically not really interesting, but historically it has its value. That Bob De Moor had an immense admiration for Hergé is an understatement. Both ended up being so symbiotic that in the end you couldn’t read Tintin without thinking of both. There are a lot of drawings around where Bob De Moor pays tribute to Hergé (including this “De la planche aux planches” in a one-page Barelli story from 1986) but some are more seldom than others. Today we present you an original, which is currently being auctioned at Catawiki and which was only recently discovered (or let us say, re-discovered). So far it fetched 240 Euro but you can be pretty sure that this price will rise in the next hours (update: it fetched 370 Euro in the end). The 19 x 13,5 cm drawing shows Tintin and Snowy as drawn by a pencil with Hergé‘s head on it. 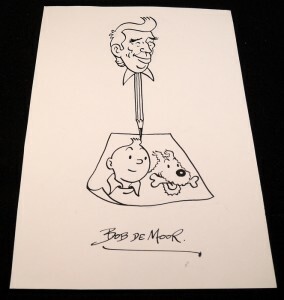 Very simple in its design, it’s quite a statement from Bob De Moor, who was perfectly capable of drawing Tintin himself (for those who would still doubt, it suffices to read the 1966 version of “The Black Island”, mostly drawn by Bob De Moor). 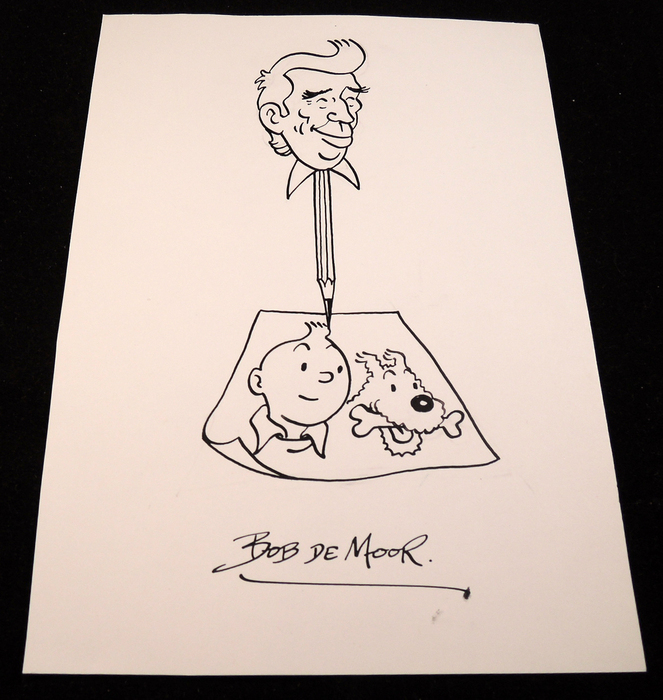 The drawing puts Hergé as main talent behind Tintin and Snowy, something which Bob De Moor always stressed when being interviewed, before and after Hergé’s death. It’s not sure when this drawing was actually made, if we have a date, we’ll update this article as such. Our guess is that it must be somewhere in the early 80s. If you have mor information about this drawing, don’t hesitate to contact us. 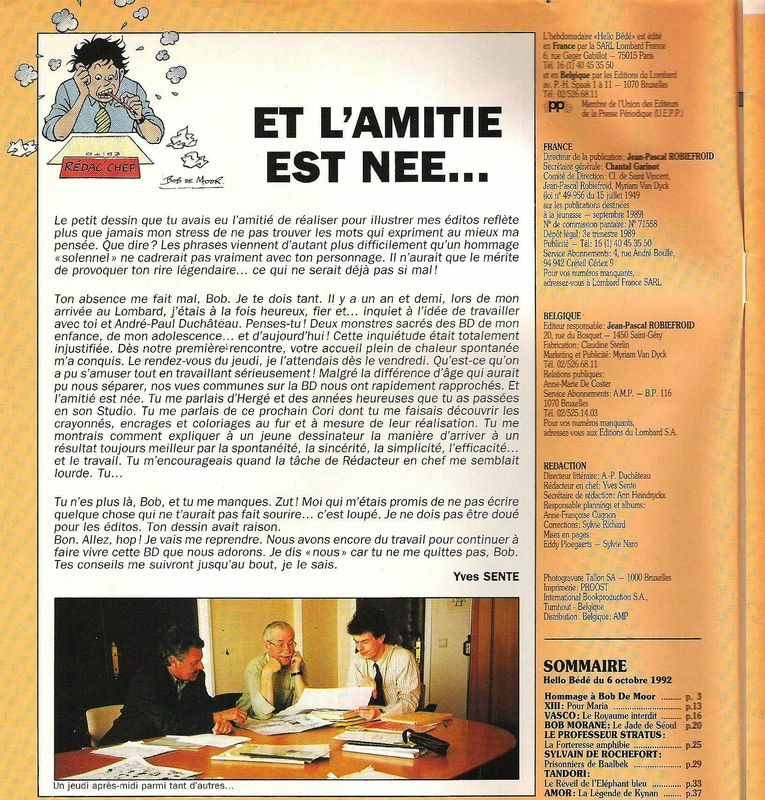 In 1989 Haarlem born Rob Harren (Lombard Nederland) was asked to put Le Lombard back on the rails and especially make sure that their comic authors got pre-publications, something which until today is key to get a (new) comic series off the ground. He contacted Bob De Moor and Belgian comics writer and mystery novelist André-Paul Duchâteau to join Le Lombard as artistic director and publisher at Le Lombard. More precisely Duchâteau would become responsible for the detective series of the Lefrancq imprint but both would have their say in what was to be published. In reality Rob Harren knew that he needed people who others would trust and who were household names. De Moor and Duchâteau were both and they made sure that Le Lombard was able to get its business back on track. Another – now famous – writer would join Le Lombard in 1991, first as editor and later in 1992 as publishing director: Yves Sente. Knowing a lot of authors through his work as an editor, Sente branched out to writing comics, specializing in continuing existing successful series where the original author had died or was no longer interested in it, for instance Blake and Mortimer and Thorgal. He also created two new short series. Yves Sente says farewell to Bob De Moor in Hello Bédé. 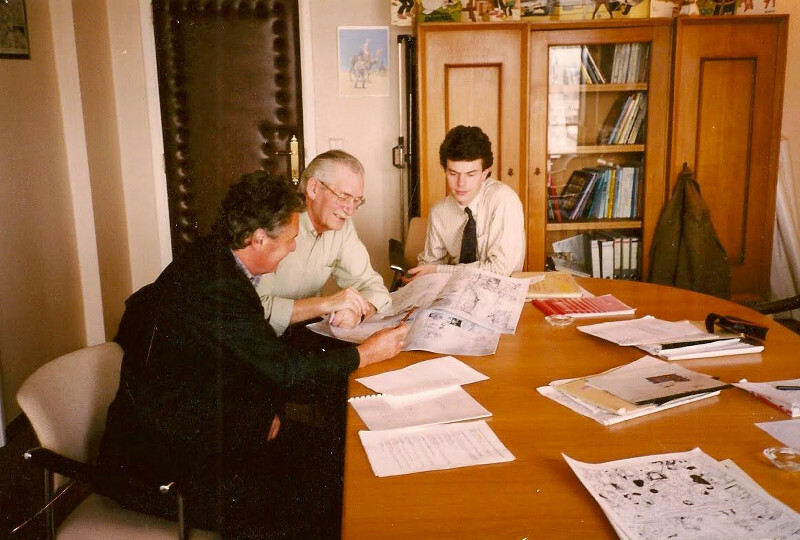 It was that very Yves Sente who sent us a picture last night of an editorial meeting that took place in March 1992 at Le Lombard in Brussels. On the picture you see the young Yves Sente on the right with Bob De Moor and André-Paul Duchâteau on the left. A different picture from the same session accompanied Yves Sente‘s farewell article in the special Bob De Moor issue of Hello Bédé magazine published on 6 October 1992. We added a scan of said page on the left.